June 8th, 2010 by KTU | Filed under 1. Plan, Montana Sleeping Pavilion. I met on site this weekend with my father-in-law Joe and our builder Jim. We staked out the pavilion so Jim can get started. 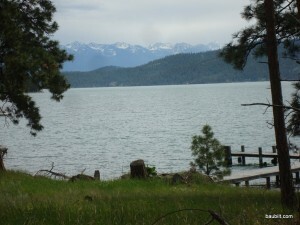 Our basic approach was to site the structure so that the deck has perfect views of the lake and the Mission Mountains. That happens to give us a southeast exposure, which is perfect. We’ll have warm sun in the morning, and hopefully a bit of shade in the late afternoon, when it can get really hot. View from the staked-out future deck.